Click on block to view instructions. Please familiarize yourself with the guidelines below before making your block. Questions? Contact Block of the Month Chairman Christy Bengston. Using fabrics from your own stash create a quilt block based on the guild pattern and instructions provided. There is no limit regarding the number of blocks entered however, fabrics should vary to maintain a scrappy feel. For each block completed, write your full name on a small piece of paper, and attach to the completed block with a pin. Bring your completed blocks to the general meeting. Blocks will be displayed for members to see. For each block completed, enter your name in the drawing. If you are unable to attend the meeting, but want to participate in Block of the Month, please arrange to have completed blocks at the general meeting either by contacting the chairman in advance or asking a quilting friend to help. At a specified time at the general meeting, based on participation, one or more names will be drawn to win quilt blocks. Example: If we receive 30 blocks, we will have two winners. The first winner will pick 15 blocks; the second winner will receive the remaining. There will be no limit to the number of times you can win. In fairness to all, if blocks are incorrect in size, have an obvious error, or are incomplete, will be returned to the maker and will not be eligible for the drawing. Please use 100% cotton fabric. Wash and preshrink fabric and test for colorfastness before constructing your block. Measure fabric and cut accurate to insure proper block construction. It is very important to accurately construct your block using 1/4 inch seam allowances. Press seams. Use an up and down motion as not to distort fabric. Finished size of the block is the actual size of the block when sewn into a quilt top. 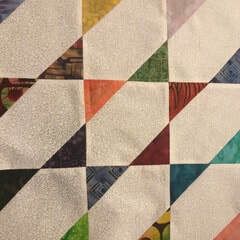 Unfinished size is the block with seam allowances. So, if you are making a 6" block finished in a quilt, the unfinished size should measure 6-1/2" because of the 1/4" seam allowance. I hope this makes sense!